This Rocky Mountain town comes into its own during summer, and the July 4th festivities downtown include a bike rodeo, a fun run, and a beer garden. 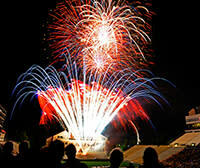 The biggest fireworks show, Ralphie&apos;s Independence Day Blast, shoots out from the Colorado University stadium and features the school&apos;s live mascot, Ralphie the Buffalo. Boulder also ranked near the top of the survey for its quirky locals and its delicious burgers, such as those at The Sink, which has been around since 1923.